How’s this for a mark of success out of the gate? 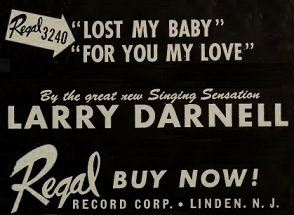 Larry Darnell released his first two singles in the fall of 1949. The first was a two-part record that hit #3 on the charts. The A-side of the second went to #1 for two months and the B-side of that single cracked the Top Ten itself. This is the third of those hits. Let’s talk about influence, something that is widely misapplied when it comes to talking about music as people – including artists themselves – often attribute it to something far different than what the word itself actually is supposed to refer to. We’ll start by talking about what influence is NOT. It’s not inspiration. The act of seeing somebody playing music and deciding to pick up an instrument yourself is something important, even monumental in a person’s life, but they weren’t influenced by it, they were inspired. Likewise one artist saying they were influenced to record a song because someone else did it, that’s not influence either. As for those who consciously mimic the exact technique of somebody else, almost trying to deceive you into thinking it was the more prominent artist, that’s more imitation than influence, though the lines can blur the less exploitative it is in its intent. In fact influence is something that most practitioners aren’t even AWARE of when they’re doing it! Real influence is found in the things that become commonplace so that when later acts come along and incorporate them into their own music they have no idea where it started because it just always seemed to be part of the musical environment they were exposed to. In the late 1920’s and early 1930’s Bing Crosby utterly changed the dominant style of singing by not following the existing trend of trying to reach the back of the theater with his voice, but rather easing back on his delivery and drawing you in as a result. Before long most singers would follow suit, aided by the improvements in microphones and recording technology, but it was Crosby who shifted the entire approach of popular singing for the next few decades. It happens less often than you think, simply because you first have to innovate, which is hard enough, then that innovation has to become accepted which in turns leads others to following that lead. There may be short-lived trends that pop up a lot, but long-term influence is another thing altogether. When it happens though you’d like to see the one responsible at least get some credit for it. Andrew Tibbs has been largely forgotten by history. He had one national hit in an era where rock ‘n’ roll, the music he performed, was aimed at no more than ten percent of the American population. Yet out of that it might only be heard and appreciated by twenty percent of that demographic… meaning, to put it in stark terms, no more than 2% of all Americans from coast to coast were even aware of his music at the time. Since just one song from his musical oeuvre made a notable national impact and even though, despite its quality, I Feel Like Crying had absolutely no shelf life beyond a few months it’s easy to see how Tibbs slipped into historical anonymity. By the time rock ‘n’ roll’s cultural reach began spreading well past that two percent (or even the ten percent that comprised the entire African-American community) in the mid-1950’s Tibbs was no longer recording even though he was only in his mid-to late 20’s. It’s likely that not a single rock fan by 1954 would’ve been able to pick him out of a lineup or that his name would draw even a glimmer of recognition. Yet everywhere you looked his INFLUENCE was palpable any time a rock artist sang with unbridled emotion, “crying” a lyric and seeming on the verge of a breakdown. Now Tibbs wasn’t the ONLY one to have done this early on, Roy Brown certainly employed a few of the same tactics and Tibbs himself was inspired by Brown early on himself remember, but Andrew Tibbs built his entire musical persona on this act of putting himself through the emotional wringer in ways that others, including pop-singers like Johnnie Ray (who had a huge interest in early rock) would later take to dramatic heights. You can hear this approach distilled in everyone from Jackie Wilson to James Brown, Axl Rose to Jeff Buckley, even though singers have different tonal qualities obviously and their deliveries and the era’s musical accompaniment all alter the way you perceive these qualities the intent remains the same. The technique is at the heart of singing ballads in rock. Andrew Tibbs didn’t invent vocal crying on record, the act of “worrying” a lyric was seen in gospel before this, which not surprisingly is where the gospel-trained Tibbs picked up on it, but he was the one who introduced it to the rock lexicon, showing how, unlike pop singing where emotional displays were subdued, in rock they could be emphasized to maximize the audience’s connection to the artist and the song, and so he deserves ample credit for that once others began to run with that technique. Though history hasn’t been kind to the legacy of Andrew Tibbs, in his own day and in his own profession he was widely admired, especially it seems by those young kids coming up just behind him, even though Tibbs was barely out of his teens by this time himself. We don’t have the quotes to prove this because of course nobody thought to actually interview most of these early rock artists about their influences, but just judging on what we hear we can see that Tibbs’s style was “borrowed” by a number of artists around this time. Goree Carter cut what can only be called a virtual homage to Tibbs on Is It True a few months back and while we can’t fault his attempt we can easily see the difference between the skill sets both young men possessed. Carter, though a fine, if somewhat nasal, singer in his own strongest efforts couldn’t hope to match the soaring vocals of Tibbs. Jimmy “Baby Face” Lewis, another kid who was even younger than the now 20 year old Tibbs, recently adapted some of his technique on All Night Lover Blues but he too didn’t have quite what it took vocally to make it convincing. Darnell though is another story entirely, because he’s got a voice that can go toe to toe with Tibbs, not just in terms of pure vocal qualities but also in technique. His specialty was in displaying heightened drama, a sense of despair and anguish that was best conveyed by the approach defined by Tibbs in the rock arena. Darnell didn’t use quite as much melisma, but that’s okay because as we’ll see throughout history that’s something that can easily be overdone, as another Tibbs derived vocalist Aaron Neville, who has the voice of an angel, has never quite learned. 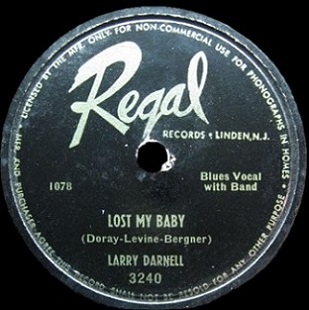 But Larry Darnell is already showing himself to have excellent judgment in how to sell a song and on Lost My Baby he ramps up the tension, his voice starting off in a near hushed whisper and gradually raising his intensity as he goes along. It’s surprisingly subtle because he does crank certain passages up, even early in the proceedings, before dropping back down, but in each stanza the emphasis on the sorrow becomes more acute until he’s got you on the edge of your seat. What is so impressive isn’t the voice, though it is impressive make no mistake about it, but that’s something he was more or less born with, or could hone over long stints singing in the shower or on a bandstand in the sticks before hitting the big time. But what really stands out is how he knows just how powerful it is when he goes to the edge of the cliff so to speak without jumping over. The ability, or more accurately the willingness to rein things in rather than to throw everything you have at the audience, is something that most singers never fully master. The all-out approach may seem like you’re putting forth a greater effort but it’s fool’s gold. The job of the singer isn’t to impress the audience, it’s to sell the song and if the song itself is good and the vocalist conveys it properly to bring out the underlying sentiments and puts you in the mindset of the narrator by how he sings, then he’s done a far better job than somebody trying to knock you out of your seat and earn applause for how much visible effort they put into it. Darnell, amazingly just twenty years old at this point, seems to fully grasp this because every word sung is delivered with just enough restraint to get you to feel his emotions threatening to break free without having to break DOWN to do it. Which is why it’s a shame the song itself, as well as the band, can’t match him in their duties. Lost My Baby is yet another tale of being dumped. By now the lonely hearts club in rock ‘n’ roll must have a six month waiting list to get in on a Friday night because everybody this side of notorious ladies man Wynonie Harris has at one time or another come home to find his bags packed on the front lawn and the lock on the door changed. So for that reason alone we’re running out of any new insight or interesting details yet to be examined in this predicament. We’re also a few years away from getting an influx of songwriters in rock who prided themselves in creative wordplay and coming up with clever and uniquely memorable lines that could stand on their own. As a result this one treads much of the same ground of the last few dozen Girl Dumps Boy themed songs. Darnell sells it as much as he possibly can, getting you to overlook its simplicity the first or second time around, but the more you focus on the lyrics the more you realize that this is about as basic a play by play recitation of a breakup as could be found. Shallow and transparent. Musically it doesn’t elevate things too much either, even though Paul Gayten’s crew don’t do anything to really trip it up either. As with For You My Love on the top side there’s a few too many higher horns for our liking, giving it a somewhat dated feel which is surely exacerbated by the dirge like pacing it requires. Gayten himself on piano, and Jack Scott on guitar are largely in superfluous supporting roles as the horns blare intermittently. There’s no chance for the rhythm section to establish the bottom because, well, because there’s no rhythm to be found and so the drums and bass, while rumored to be in the room, might as well be depicted by just a painting hanging on the wall for all they get to contribute. Luckily no one bothered to tell Lee Allen that HE wasn’t needed on this session because the budding tenor sax legend delivers the most rousing aspect of the record with a mid-song solo, apparently prompted by the squawking of the trumpet and alto sax, as it sounds as if somebody jabbed Allen in the backside with a stickpin as he lets out an elongated roar – half squeal, half muted honk – that injects some life into it but that’s still not enough. Everything falls back on Darnell and he does all he can to convince you this is far better than it really is – that thrilling closing note he leaves us with makes arguably the strongest case yet as to the breadth of his vocal ability – but for once that vocal ability alone isn’t quite enough to win us completely over. What’s so frustrating is how nobody here, save the singer himself, had any aspirations beyond simply making this serviceable. We always can forgive a flawed performance more easily than limited goals because a good effort by all involved should be the one standard everybody can reach. Ultimately a singer is just one part of the final product, maybe the most important depending on how you look at it things, but not so much that he overwhelms the need for other parts to be reasonably well-executed. If we let ourselves get carried away by Darnell’s performance we risk over-crediting one aspect of a record that otherwise falls short on two other very important aspects, but if we focus inordinately on the relative failures of those two areas without letting ourselves be swayed by the centerpiece of the entire performance then we miss the boat in another way. Larry Darnell has nothing to apologize for with Lost My Baby, he’s as good as we could hope for considering what he has to work with, but if we’re going to be overly generous and hand out extra points for this type of singing prowess alone then we’ll wait and give them to Andrew Tibbs for showing how this could be done in the first place. Leave a reply on "Larry Darnell: “Lost My Baby”"